1-	How much did you parents’ business influence your decision to join the bridal luxury field? Very much! I can’t deny that growing up in a family that has already paved the way for a bridal luxury career was a major contributor to finding and pursuing my passion in life. I can’t be more grateful to having had the chance to discover this exciting world at a young age and have role models to learn from. 2-	It’s a tough and competitive world out there. Does it get tiring to run a worldwide growing brand like Esposa? There is no doubt that these are challenging times for the fashion world. Competition has never been higher, especially with the rise of digital marketing, not to mention the rise of talents worldwide. Leading the growth and expansion of Esposa internationally has definitely been challenging but when passion is big enough, no room is left for fatigue or second thought. Nothing can stand in the way of your motivation to accomplish your goals and realize the dreams you’ve always had for yourself. 3-	What keeps you going and inspire you to lead the brand forward against all odds? My drive stems from my passion for the business as well as my family who supports me unconditionally and inspires me very much. No matter how wrong things can go – and sometimes they do! – I rely on these pillars to recharge myself with the strength and energy that push me forward, towards my dreams. Knowing that your hardwork pays off and that Esposacouture creations have been pleasing and dazzling countless women is the biggest reward for me, and an unbeatable source of inspiration. 4-	How can you describe Esposacouture for us? Esposacouture is tailor-made for the romantic and the sophisticated. The atelier’s enchanting creations redefine the glamorous woman through rare and luxurious fabrics, elegant designs, meticulous details, and an unmatched craftsmanship. Esposacouture is exclusive haute couture weaved with passion and mastery. 5-	What are the Esposacouture creations you are most proud of? It’s very hard for me to choose from these creations, especially the 2017 collection, because each and every piece is to die for! Esposacouture weaves women’s biggest dreams to create exclusive statement dresses that are unique to every bride. 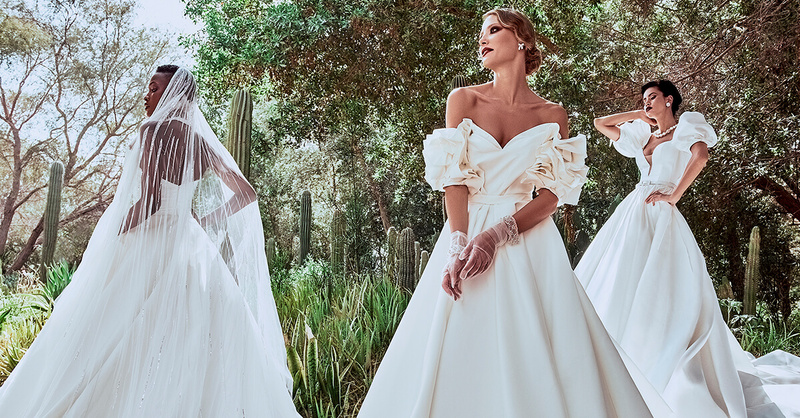 The atelier translates years of expertise in the bridal fashion market coupled with a deep understanding of what brides desire, resulting in bespoke creations distinguished by skilled mastery. 6-	How many hours of work requires every hand-made dress made by Esposacouture? Because every hand-made piece is unique, each one has its own requirements in terms of number of workers and time of creation. However, on average, we can consider a time of 2 full months for the creation of an Esposacouture dress. 7-	Any special projects inside Esposacouture atelier right now? It’s very busy inside our atelier at the moment as we have started the production of the 2018 collection. Many exciting projects underway that we can’t wait to reveal! 8-	What is the creation process of the Esposacouture collection? Every creation process starts naturally with brainstorming, which lasts for weeks inside our atelier. During this phase, we elaborate mood boards about the fabrics, the cuts, and the overall feel of the collection. The second phase witnesses the concretization of these boards into rounds of sketches from which we keep only our favorite. This is when execution starts in our atelier, bringing exquisite designs into life through the great craftsmanship of our workers. 9-	Who is the Esposacouture bride? She is definitely not any other bride. The Esposacouture bride is a couture queen by excellence; she is fashion-savvy, she knows what she wants and loves to stand out. She wants to be unique and she’s not ready to compromise on any detail to make her desires come true. She wants a tailor-made dress because she knows that her dream dress simply cannot be found anywhere. 10-	What is the inspiration for the SS17 collection? Princess gowns, definitely! The Spring-Summer bride deserves to look no less than royalty on her big day! Esposacouture collection makes sure of that by resorting to heavy beadings and long trains, luxurious fabrics and impressive cuts, and volumes of unrivaled elegance. The dresses present different cleavage options to suit all shapes and bodies. Esposa is a bridal boutique offering every bride-to-be a one-stop store to find and shop her wedding look including her dream gown, the perfect wedding shoes and the accessories that she needs. The Esposa boutiques, offering accessible and trendy gowns, are located in Lebanon (Dbayeh and Verdun) and Yas Mall, Abu Dhabi. The Esposa Prive’ boutiques, offering luxurious and romantic gowns, are located in Down Town, Lebanon and Dubai.